AURORA, Colo. -- An undercover investigation by Scripps station KMGH in Denver has revealed another unlicensed person practicing health care in defiance of multiple state cease and desist orders handed down by regulators. A February KMGH revealed 28 people had received such cease and desist orders from state regulators, but the state did little to ensure they actually stopped, and most never faced criminal charges. One of those people was Alfredo Ruiz, also known as Alfredo Ruiz Rueda, who received cease and desist orders from the Colorado Medical Board in 2013 and again in 2017 . A search of the state’s professional license database shows Ruiz does not hold any kind of license in Colorado. In the orders, the board said Ruiz used laser equipment only appropriate for licensed medical professionals, and ordered him to stop providing skin injections. State records show Ruiz previously operated clinics called CI Laser Clinic and Central Integral de Belleza y Salud in the Denver area. It appeared Ruiz closed his clinics after receiving each order, but KMGH recently called the number posted online for those clinics and discovered Ruiz had reopened his business at another location. A producer left a message and received a phone call back in Spanish and a text with the clinic’s new address. The producer made an appointment for a Botox treatment. 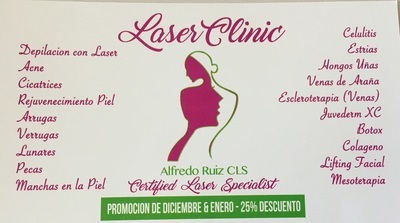 Outside of the clinic’s door, a sign is posted listing various skin care services, injections and laser treatments in Spanish along with Ruiz’s name. Two KMGH producers brought hidden cameras into the office to speak to Ruiz about Botox. When asked if he was a doctor, Ruiz responded affirmatively multiple times. He said he had 12 years experience and estimated he sees 10 patients per day. He showed the producers needles he would use to administer Botox, and he estimated one 28-year-old producer would likely need extra treatment costing between $135-$180. When confronted after the appointment by KMGH reporter Ryan Luby, Ruiz claimed he was a doctor in Mexico. He also pointed out the certificates -- not state licenses -- on his wall indicating he had completed laser training. Ruiz indicated he works under the supervision of two licensed doctors whose names were posted on the sign outside of his clinic. Neither doctor was present in the office. When KMGH reached one of the doctors by phone, he said he had not worked with Ruiz in years and was surprised to learn his name was posted at the office. The other doctor could not be reached. 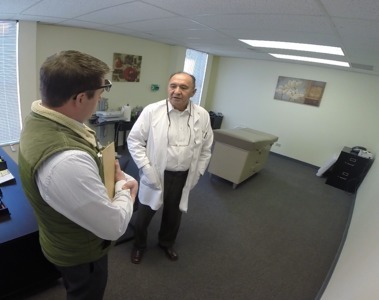 When KMGH returned to the office days after the initial confrontation, the sign bearing the names of the other two doctors had been removed from the door, but the sign with Ruiz’s name and the services he offers remained. The state does allow for some “medical-aesthetic services” including laser treatment and injections to be administered by unlicensed individuals under the close supervision of a licensed physician. The medical board’s rules for such agreements requires documentation of the arrangement be “available to the public at the site where the delegated medical services are performed.” Ruiz did not produce any such documentation nor was it readily visible in his office. The board’s rules also require that patients are fully informed of such arrangements and sign forms affirming they have been made aware they are receiving care from an unlicensed person. “When the delegating physician is not actively involved in the patient encounter, the disclosure shall include: the service the patient is receiving is a medical service; the delegatee of the service is not licensed by the state of Colorado or is acting beyond the scope of his or her Colorado license, certification or registration; the delegatee is providing the service pursuant to the delegated authority of a physician; and, the delegating physician is available personally to consult with them or provide appropriate evaluation or treatment in relation to the delegated medical services,” the rules say in part. KMGH’s undercover producers received no such information during their discussion with Ruiz about Botox treatments. The Department of Regulatory Agencies (DORA) acted quickly upon learning from KMGH that Ruiz was still practicing. The state’s medical board convened an emergency meeting and the state obtained a temporary restraining order against Ruiz. The state also referred the case to law enforcement for potential criminal charges for the second time. In 2017, DORA alerted the Denver district attorney about Ruiz but the DA’s office did not pursue an investigation because his previous office was already closed. Aurora police are now investigating Ruiz’s latest clinic, which police say is now vacant. 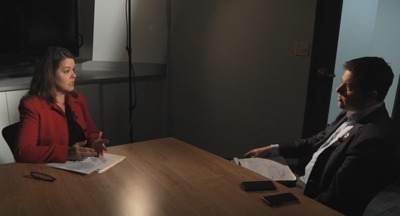 The office of Colorado Attorney General Cynthia Coffman sent subpoenas to KMGH seeking its video and a producer’s testimony to present as evidence in court as it seeks a permanent injunction against Ruiz. That marked the second time the state has subpoenaed KMGH’s investigative materials as evidence in court to seek court orders against unlicensed individuals. Last month, a KMGH producer testified in court in response to a subpoena in injunctive proceedings against Randy Flynt , who claimed to be a clinical psychologist and kept his office open more than a year after the state issued three cease and desist orders against him. In that case, the attorney general’s office played a portion of KMGH’s undercover video in court and the judge granted the temporary injunction. Pueblo police have also issued a warrant for Flynt’s arrest. In the Ruiz case, an injunction hearing is set for April 23. DORA said it is making numerous improvements to its process for handling unlicensed individuals in the wake of KMGH’s investigation – changes first ordered by Governor John Hickenlooper in the days after the initial stories aired. Ronne Hines, director of DORA’s Division of Professions and Occupations, said the agency is revisiting its handling of unlicensed practice complaints. “We’re working to take actions to be more proactive to better protect consumers,” Hines said. Hines also said the department is hoping to speed up its own investigations of complaints about unlicensed people practicing in health care fields. In the case of Alfredo Ruiz, internal records showed state investigators took months to visit his Denver clinics after each prior complaint received about him. DORA also said it is auditing its website where disciplinary orders are posted publicly after the Ruiz case exposed problems with the site. KMGH discovered the two cease and desist orders against Ruiz were not available to any consumer who searched Ruiz’s name in that database because they were both filed incorrectly – one under the name “Alfredo Rioz” and the other filed without any name attached to it at all. State regulators fixed the problem several days after KMGH brought it to their attention. “We’re taking a lot of additional steps to be more proactive based on the reports and the work that you’ve done,” Hines said. Aurora Police Detective Lance Highland is asking anyone who was a patient of Ruiz to contact him at (303) 739-6334 or by email Aurora PD added it does not get involved in any immigration matters involving any potential witnesses or victims. Ryan Luby is an award-winning investigative reporter for KMGH. Connect with Ryan on Facebook , on Twitter , or by email to Ryan@TheDenverChannel.com . If you have a story idea or a tip for our investigative team, email Denver7 Investigates or call our tip line at (303) 832-TIPS. You can remain anonymous.